Since it’s my home state, I need to toot its horn right? Speaking as someone who lives here, I don’t ever think of it as a destination wedding spot. Usually when anyone thinks “destination wedding” they think beautiful white sand beaches and aqua blue waters. But I have sort of come to understand that a “destination wedding” really means, “Do the majority of your guests have to travel far to get there?” And of course now that I have put myself into “The World Of Weddings,” I am looking at Maine in a whole new way: as a destination wedding spot. One of the coolest things about Maine is that it boasts all these little islands off the coast, that make for beautiful wedding venue. So I thought I would show you a little of the destination wedding state I live in, and what better way to take a Maine wedding tour, than with a Maine wedding photographer! I chose a wonderful Maine photographer that works with Real Maine Weddings to give a couple a $100,000 for free! Emilie.Inc is the kind of loyal Maine company that knows how to really capture the beauty of the state. I love that they have the giving spirit and I LOVE that they love Maine! The most popular place to marry in Maine is on or near the beach. There are so many beaches and islands to choose from, and many of them have a great old world charm that can really make your wedding stand out. Check out this great island venue that is a popular Maine wedding spot! 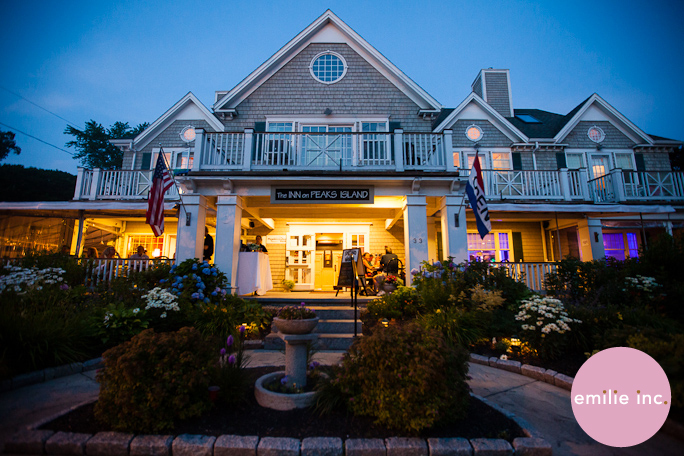 The Inn at Peaks Island is such a cute spot for a wedding, with great views of the ocean! If you aren’t a beach girl, but are still a fan of the water, Maine has tons of gorgeous lakes and woodsy spots for a rustic wedding lover! After looking all around Emilie.Inc I found one photo that I HAD to show. I really think this photo captures the essence of Maine brides, outdoorsy, fun, and up for anything! Wherever you go in Maine to wed, there is one thing you CANNOT forget to include, especially for your out-of-state guests! Lobster! Or, as we say in Maine, Lobst-ah! This down east delicacy should be a part of every wedding. I don’t think I can get enough of lobster! If you want to know more about Destination Maine, Emilie.Inc runs their own wedding blog, all about Maine weddings! It’s called Love & Lobster and it’s a great place to start when creating your Maine wedding getaway!